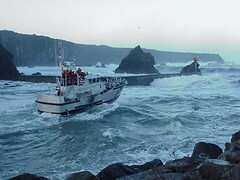 This Oregon Coast Guard Lifeboat heads from the Depoe Bay harbor entrance out to sea. Many of the rescue missions on the Oregon Coast are in the winter when the weather is harsh and waves can reach 30 feet or more. Oregon's rocky coastline often combines dangerously with high seas and some difficult to navigate entries to ports. Commercial fisherman bravely challenge these conditions to bring in Salmon, Dungeness Crab, "Snapper" (actually a rockfish here on the west coast), Sole, and more. Thanks to the coast guard disabled vessels have a chance of surviving Oregon's stormy coastal seas. USCG photo by BMC Chris S. Sparkman.